Come Monday, October 1 the agreement between toy maker Hasbro and game maker Zynga finally bears fruit (and vegetables), as physical games based on digital favorites hit store shelves. Who's up for some Hungry Hungry Farmville? If anything can pry your Zynga game-loving friends and family off the computer, it's Hasbro's line of games and toys, social games the way we used to do them back in the hood — face-to-face. In the case of Draw Something and Words with Friends, it's a relatively easy transition. Both social games are based of off physical games in the first place, so it's only a matter of retooling Pictionary and Scrabble — both Hasbro properties — to reflect the game properties. Presto, chango! Now we've got three different sizes of Words with Friends, the travel size ($14.99), normal size ($19.99), and the Luxe version with rotating board, and a $19.99 version of Draw Something that comes with four different color crayons. FarmVille and CityVille are a bit trickier, but Hasbro seems to have it under control. CityVille Monopoly ($24.99) was a natural choice, really, and packaging stuffed FarmVille animals with classic card games for $9.99 sounds like a plan. The CityVille Skies game ($12.99) gives players a 3D blimp to use on their iPod, piloting it over the streets of a virtual city. 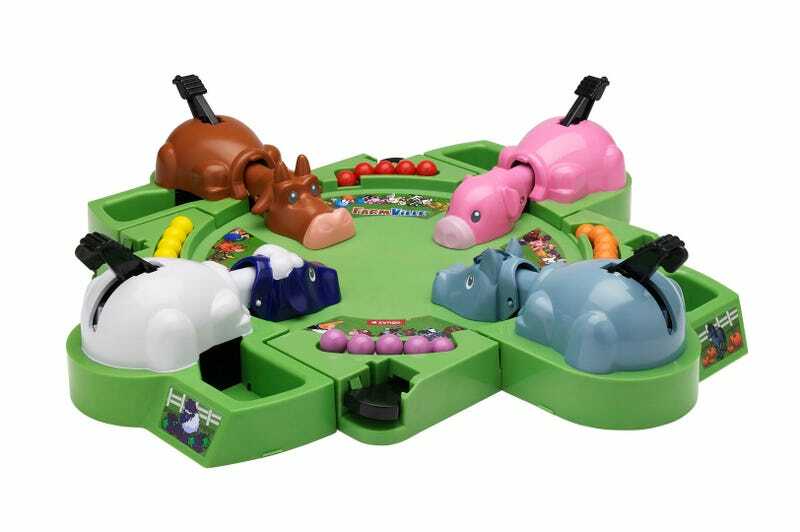 The most inspired choice, however, was the FarmVille Hungry Hungry Herd game ($22.99). Talk about milking the nostalgia. Most of these products come with special bonuses for the video games they represent (FarmVille and CityVille cash, Words with Friends bonuses), so even if your loved one has no interest in the physical world they still get something out of the bargain. I know my Christmas shopping just got a whole lot easier.